A new feature added to Gmail today called Insert Photo lets you instantly access any of your smartphone’s photos that have been backed up by your Android phone, even while on the web. You’ll also need to be OK with storing all your phone’s pictures in Google’s cloud. Doing so is free, and no one will see your photos or albums unless you choose to share them in an email. Cloud storage does make your pictures vulnerable to law enforcement snoops, however, so be careful not to take any pictures you wouldn't want the NSA seeing. In another, related new feature, you can now resize images you’ve inserted into a Gmail message. Just click and drag the corners of the photograph until it’s the perfect fit, much like you would with a photo inserted in a Microsoft Word document. 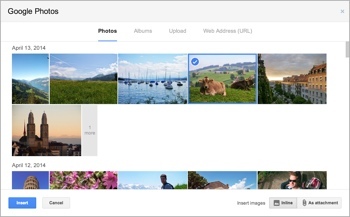 For more on these new Gmail photo features, visit the Official Gmail Blog. For more great options for showing off your best pictures, check out our guide to choosing a photo sharing service and our favorite photo sharing sites.